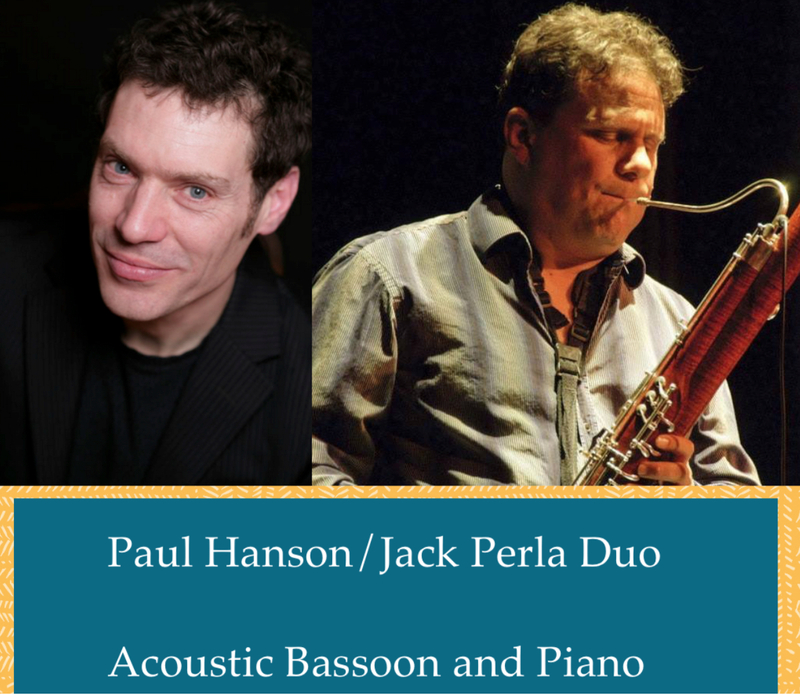 Rekindling their Acoustic Duo after 15 years-bassoonist Paul Hanson and pianist Jack Perla perform original music featuring compositional depth and improvisation. Compositions will be announced from the stage of this chamber jazz duo. This concert is $20 (suggested donation). Seating is limited. Get your required online reservation here. 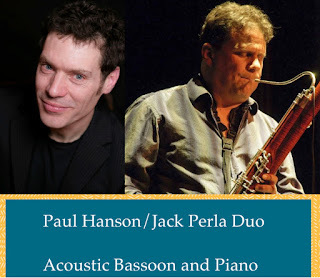 As a jazz bassoonist: Paul has recorded and/or performed with Bela Fleck and the Flecktones, Wayne Shorter, Peter Erskine, with 6-string bassist in the group OoN, Billy Childs, Harmonica virtuoso Gregorie Maret, Billy Higgins, David Binney, Ray Charles, Charlie Hunter, Patrice Rushen, Alex Acuna, Dennis Chambers, Abraham Laboriel, Medeski Martin & Wood, Bob Weirʼs RATDOG and been awarded grants from the NEA and the Berkeley Jewish Music Festival. Jack Perla Jack Perla is active in opera, jazz, chamber and orchestra music. His operas and instrumental compositions have been widely performed, and he’s played jazz and world music in the U.S., Europe and Japan. Beginning over twenty five years ago in New York with his group Music Without Walls and continuing after moving to San Francisco, Jack has steadily forged a reputation for his unique cross-fertilization of jazz and classical music. He’s been commissioned by the Los Angeles Opera, Opera Theatre St. Louis, Houston Grand Opera, Seattle Opera, The Paul Dresher Ensemble, TwoSense, MATA, and many other performers and organizations. Maybeck Studio for the Performing Arts, 1537 Euclid Ave., Berkeley, CA 94708. Powered by Blogger.